Scholarships | Delta-Montrose Electric Assn. DMEA’s scholarship application period is currently closed. DMEA along with wholesale power providers, Tri-State Generation and Transmission Association, and Basin Electric Power Cooperative offer scholarships to local students each year. Funding is made available through DMEA’s Unclaimed Capital Credits Fund. Scholarships awarded to 4 students who are currently enrolled full-time in an accredited post-high school educational institution. Scholarships awarded to 3 students who are planning to attend or are currently enrolled in full-time in Colorado Mesa University-Montrose Campus. Scholarship awarded to 1 graduating high school student from DMEA's service territory. 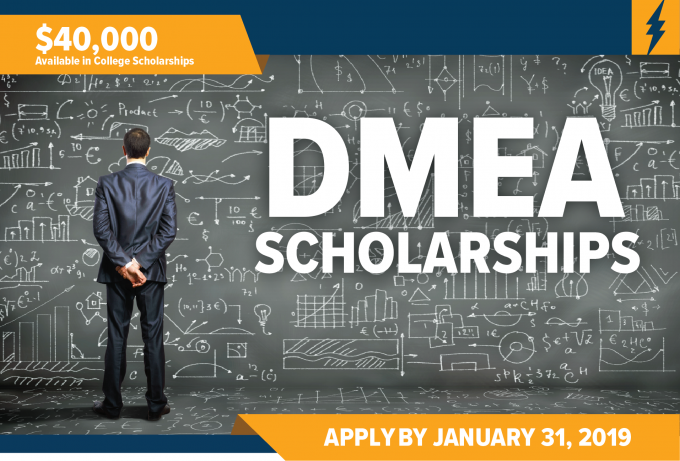 The application period for DMEA's 2018 - 2019 scholarships is November 19, 2018 - January 31, 2019. Students must apply online using the links above. All transcripts and documentation must be uploaded through the online application portal. Any applications turned in otherwise will not be accepted. Please be sure to read all requirements and have all documents prepared before starting the application process. This includes your essay: Pick a controversial problem on your school campus and suggest a solution to improve or solve the situation; minimum 250 words.